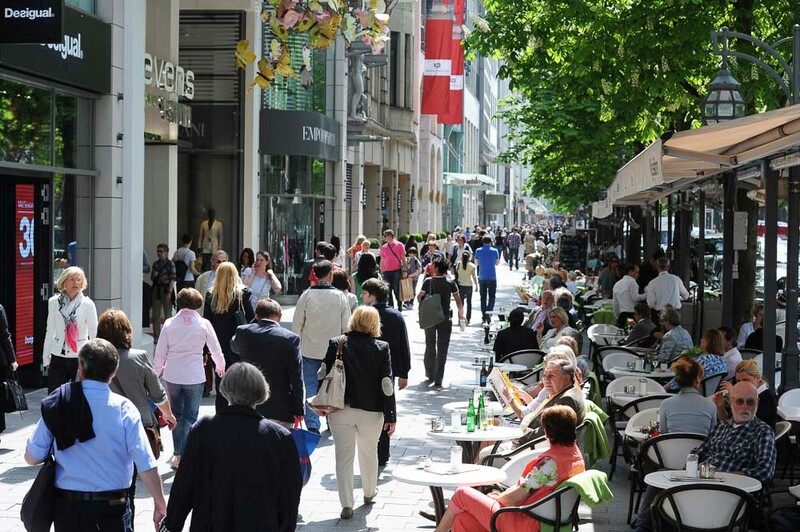 Düsseldorf is one of the most elegant shopping metropolises worldwide, with its exclusive Königsallee, a splendid boulevard featuring luxury shopping malls and flagship stores, and Schadowstraße, the shopping street achieving the highest turnover in Germany. And last but not least, the trendy boutiques of the Altstadt. This is shopping at its best! The names of fashion designers having shops in Düsseldorf read like the Who’s Who of the trade – Armani, Kenzo, JOOP, Jil Sander, Uta Raasch, Onofri, Féraud and many more. The world’s largest fashion fair, where the most famous designers meet several times each year, guarantees that the latest trends will reach the shop windows in no time at all. Several times a year, the metropolis on the Rhine turns into the mecca of the fashion business, when the doors of the trade fair open to the CPD and the GDS, the leading fashion fairs worldwide. Düsseldorf’s best known trademark is probably the Königsallee. It is one of a small number of internationally known streets that can justly be called a boulevard. Lovingly called ‘Kö’ by friends all over the world, the magnificent boulevard with its exquisite shopping malls and arcades is always one of the main topics when people talk about Düsseldorf. Apart from ladies’ and men’s fashion stores, there are also jewellers, antique shops and book shops. Whether you are shopping or relaxing in one of the numerous pavement cafés – you will experience live the motto of this unique boulevard: ‘To see and to be seen’. Exklusive and extravagant flagship and mega-stores make the Kö one of the world’s most renowned shopping miles. The Schadowstraße with its department stores and numerous shops, close to Königsallee, is one of the most frequented shopping streets achieving the highest turnovers in Germany. The numerous shopping malls on and near the Kö make shopping a pleasure even on rainy days. Discover with every step the flair of Germany’s leading trade fair city in this attractive mall on Düsseldorf’s most exclusive boulevard. A shopping experience with about 130 exclusive specialized shops, international top labels and an outstanding range of food and drink. A forum for culture and meetings, for exhibitions and action with a constantly changing programme of events. The glass roof of this department store allows the light to reach all seven floors right down to the food hall in the open basement. Its name alludes to these seven floors. The shopping concept of the future is ‘theme retailing’ and is based on a grouping of shops by themes on the individual floors. This creates theme worlds corresponding with and supplementing each other. On a total surface of 15,500 squar metres, the customer is immerged into the worlds of fashion, design, multimedia and lifestyle. The theme store on Grünstraße is in the direct vicinity of Königsallee. On 17,500 square metres spread over 5 floors, 45 shops sell everything for the home by internationally renowned designers. On sunny days the glass roof can be opened, giving an impression of open air shopping. The Schadow Arkaden, a high-class world of shopping and entertainment, is considered the entrée to the Königsallee and Schadowstraße. The star-shaped mall in the heart of the city is not only an excellent shopping address, but also a venue for regular attractive music events and exhibitions. The forum with its restaurants from the trattoria to the Sushi bar is an invitation to relax. Düsseldorf’s Altstadt, known universally as the ‘longest bar in the world’ due to its more than 260 pubs and restaurants tightly packed on 1,5 square miles, not only invites to pub-crawls, but also to enjoyable shopping sprees. Quaint boutiques and avant-garde shops in small lanes and side streets offer curios and new trends in fashion. There are also numerous high-class museums and galleries along the so-called art axis on the Rhine. In combination with art, culture and restaurants for all tastes, shopping in the Altstadt has its very unique flair. The Karlstadt is one of Düsseldorf’s most idyllic districts, its baroque buildings dating mostly from the 18th/19th century. On Carlsplatz, the heart of the Karlstadt and Düsseldorf’s largest and best-stocked vegetable and fruit market, the stalls display goods from all over the world. Due to its great number of antique shops, galleries and art dealers, especially in Bilker Straße, the Karlstadt is a favourite address for lovers of the arts. Düsseldorf has the largest Japanese community on the European continent. In the vicinity of the nikko Hotel on Immermannstraße, you will find a wide range of Japanese supermarkets, book shops, restaurants etc. as well as the Mitsukoshi department store. From the southern end of the Kö to Friedrichstraße stretches the southern city shopping mile. A wide range of shops selling books, home electronics and consumer goods, but also numerous pubs and restaurants for every taste are well worth a visit.